I was a little slow this morning, both mentally and physically. The snooze button on my alarm was pressed for a full 45 minutes before I finally crawled out of bed. I knew the weather was supposed to be cold and dreary today so I'll blame my lack of motivation on that. When I puttered out to the kitchen to work on prepping today's eats I had nary a clue as to what I would fix. As I shuffled things around on the top shelf of my fridge, I accidentally knocked a small container of Fage to the floor. After picking it up and discovering the crack that had formed in the bottom of the container, I realized that breakfast was solved. 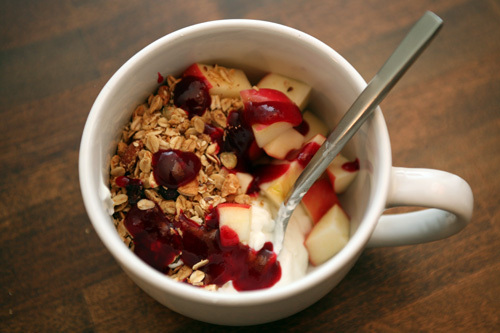 Breakfast: one 6oz cup of 0% Fage, 1/2 a pink lady apple, 1/4 cup of homemade granola from my lovely friend Beth and a drizzle of cranberry ketchup. Perfect combination. I truly loved this breakfast. Have I mentioned that the CK is good on EVERYTHING? I know you're probably sick of reading about it, but I've got just over one jar left to finish up before it goes bad so I'll happily continue to experiment over the next week. In fact, this morning I made my hubb a brie, apple, spinach and cranberry ketchup sandwich on honey wheat bread. He LOVED it, as did I when he brought over a bite for me to taste. After solving my breakfast and the hubb's lunch, I was at a bit of a loss thinking about what I wanted for lunch. I thought about more meatball soup, but decided I should give it a rest and add some variety back into my meals and my blog. There are a couple of sweet potatoes on the counter that I thought about baking, but didn't have time. Same with the spaghetti squash. I finally settled on a bag of dried french lentils in the pantry that I've been meaning to make a salad with for quite some time. It seemed that I had enough time to quickly simmer them soft, but I wasn't altogether sure since it had been awhile since I'd made them. I brought 1 cup of french lentils to a boil in 2 cups of chicken broth, reduced the heat and simmered for 40 minutes, 10 minutes longer than I had anticipated which resulted in a very rushed salad prep. They are still slightly crunchy, which I like. I'm not a big fan of lentils when they turn to mush. Tossed with chopped bell pepper, cucumber, olive oil, balsamic vinegar and creole mustard, this simple salad turned out pretty well. 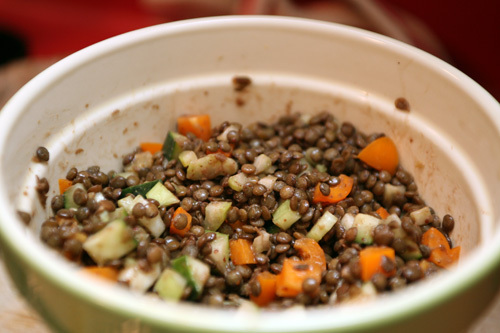 I'll be experimenting more though because I've had many better lentil salads at restaurants around town. 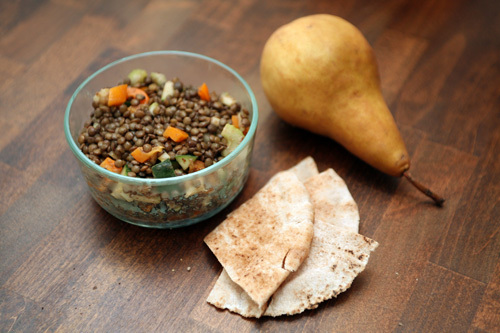 Lunch: Lentil Salad with 1/2 a whole wheat pita and a pear. I meant to sprinkle some crumbled feta on top of the salad, but in my rush I forgot. Maybe tomorrow. 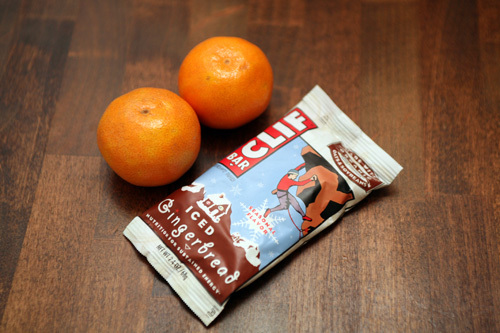 For snacks I brought: 2 clementines and an Iced Gingerbread Clif Bar, I only ate one of the clems. I also had two more dark chocolate covered potato chips. Yes, I said potato chips. I don't know why they don't show the dark chocolate option on the website, but I definitely prefer dark to milk chocolate these days. I wish the chocolate was a little thinner so you could taste a bit more of the salted potato chip, but they are delicious all the same. During my lunch break I perused the last couple of days of the NY Times Dining + Wine section on the web. I came across this recipe and couldn't stop thinking about it. I'll blame it on the rain again. 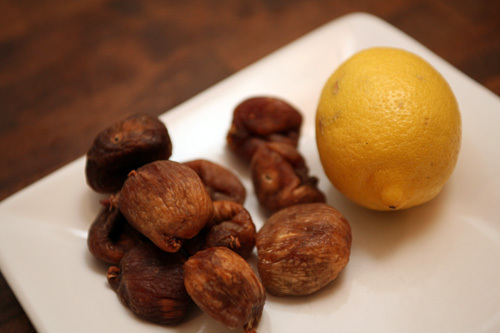 So, I hopped in the car with my hubb for a couple of late-lunchtime errands and purchased 4 chicken thighs, some dried figs, honey and lemons. Also, some kale. I've been craving greens since I couldn't find them for our New Years Day lucky dinner. Dinner: Broiled Chicken with Honey Fig Sauce, sautéed kale and roasted garlic rice. 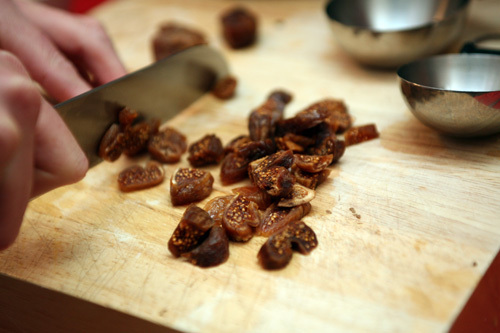 I discovered a new love for dried figs. They are perfectly sweet and soft, and the seeds provide a wonderfully satisfying crunch. Love. The chicken is broiled in the oven until the outside is delicately crispy and the inside still moist. 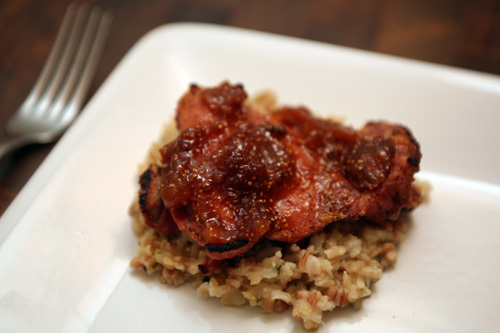 The figs are simmered with honey, white wine and spices until a thick glaze forms, then drizzled over the chicken. 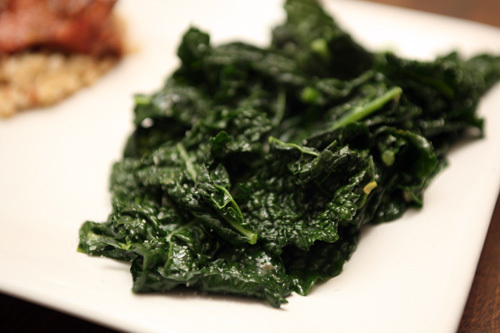 Paired with one of my longtime favorites, sautéed kale, this meal was a sure winner. 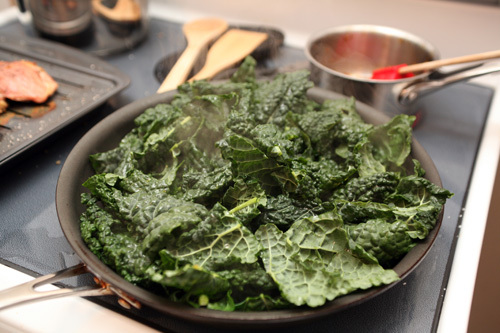 We sautéed the kale in olive oil with some garlic, salt and pepper until the leaves wilted slightly and turned bright green. 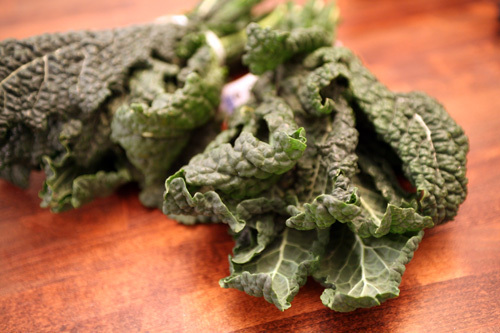 Before serving, we squeezed a bit of lemon juice across the kale. Perfect. At any rate, I'm a very happy girl after eating this simple gourmet meal. 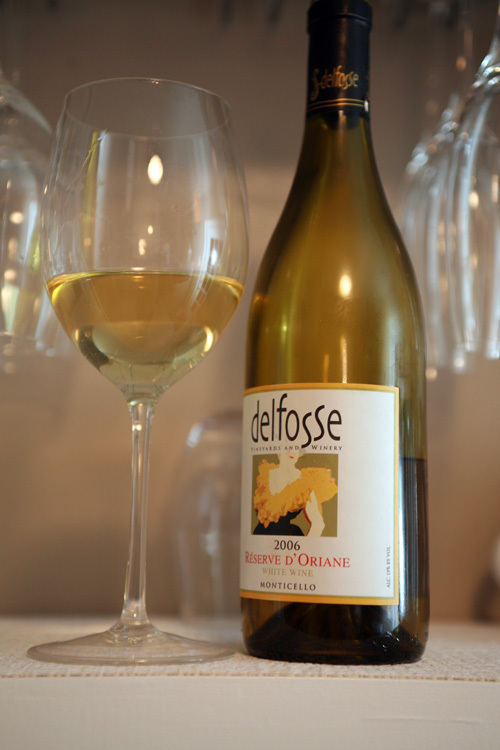 Especially since we paired it with one of my new favorite wines, a local white that we used in the glaze as well.